So today I did a quick talk where I shared some tips that will help keep you safe if you are ever attacked and find your self having to defend yourself. These tips do not involve techniques they are all mental but they will help keep you safe regardless of how much training you have done. Obviously the more training the better. So let me just share these tips quickly and if you have any questions please let me know. First things first you have to know you are ready and that you will be okay. Do not let fear getting into your mind at all. Now training is something that will definitely help you here. The better your training the easier it is to be confident. At first when I was training in a karate like style I was not truly confident. It helped and I thought I would be okay when I needed to defend myself but it wasn’t until I got pretty good in Judo / BJJ that I was truly confident in defending myself. And its a great feeling to have. This will help a ton. Simply put you want to know where you are strong and try to make the ‘fight’ happen there. Avoid your weak areas at all costs and make sure that is not what determines the outcome of the fight. I know I am strong in terms of throwing or in the clinch and on the ground if I end up there. So I want to make all self defense situations about throwing if I can. I dont want it to look like a boxing match at all!! To be honest a lot of people really mess this up! The goal of a self defense situation is to get home safe. That is it. You dont need to look cool, you dont need to hurt the other person and you dont need to try a cool move you learned on youtube. You just need to get home safe. Make sure your ego does not get the better of you. No matter how good you are.. or how strong the other guy is. You should 100% out work your attacker. Your life is in the line. Make sure you do everything you can to accomplish your goal. Whatever it takes you need to get home to your family. Dont forget that. As always if you have any questions please just let us know and we will do our very best to help you out! Here are five tips that can help you reduce the amount of stress that you are dealing with. Take a quick read and let me know what you think! 1. Exercise. Train, Run, Lift. Get moving. Exercising can get your mind off of your worries, relax you and can improve your mood for hours after. 2. Spend Time With Friends / Family. Its amazing how good friends and family can make you feel. When you are stressed make sure you spend some time with the right people! 3. Journal. Write out what you are worried about and why. Think of it as a way to get those thoughts out of your head. 4. Get Outside. We spend way too much time indoors. Get outside. Take a walk breath in some fresh air. Kick your shoes off. It can be very relaxing. 5. Positive Thoughts. Force yourself to say good and positive things about yourself and your life. Make it a habit to do it whenever you are feeling stressed. Ok So today I shot a video where I share a few tips that will help you defeat a larger attacker. No obviously this is something that training will help. However just training might not be enough or if this is something you do not address in your training you might be in for a bit of a surprise. 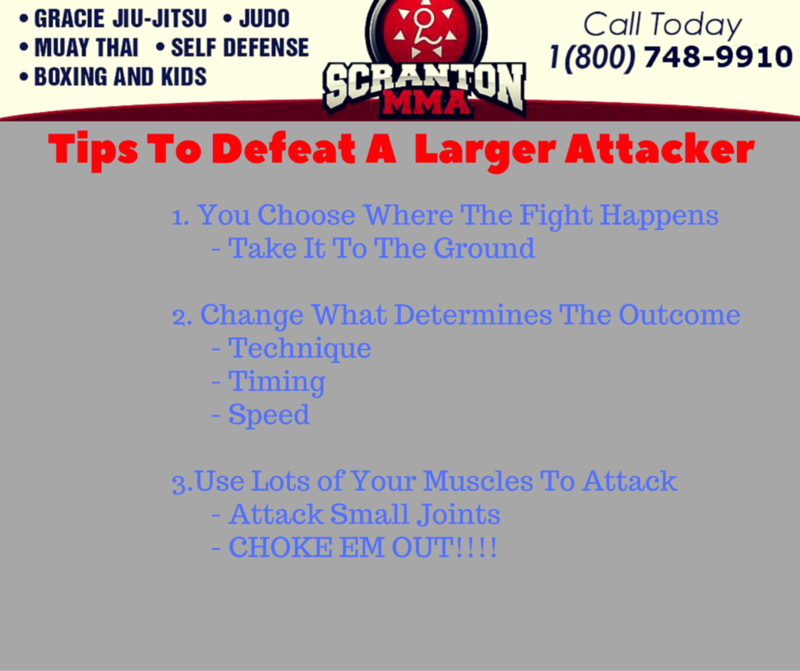 I think it is very beneficial to train with some if these tips in mind and Some of the best grapplers out there always keep these in mind while training. So with all that said lets get into the tips. 1. You Choose Where The Fight Happen. I think the number one thing you can do to give yourself an edge against a larger attacker is to chose where the fight will happen. The most obvious way to use this tip is that if the attacker wants to make the attack look like a boxing match it is to your advantage to make it a grappling match. Most people would agree that it is much easier to fight a stronger person on the ground especially if that person does not know how to fight on the ground. Being proficient in ground fighting actually lets you use the attackers strength to attack them. Again this goes to taking control of the situation as best you can. Why would you want the fight to be all about strength. Instead turn things around so that the winner will be determined by things like technique, timing and speed. Again one of the easiest ways to make this happen is to not get into a strength contest. Make it a grappling contest.. take the fight to the ground. This allows the person who is more proficient at ground fighting to win the fight. The easiest way to end a fight against a large attacker is to use a submision. Submissions allow you to use a lot of your body parts / muscles to attack small(er) parts of your attacker. For instance when you armbar someone you get to use your arms, legs and back muscles to attack a persons arm. You have a very good chance of winning that battle. 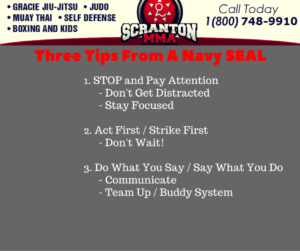 So today I shot a quick video where I talked about a few tips that a Navy SEAL Shared with us while we had him in for a seminar at Scranton Mixed Martial arts. Now these are not your average safety / self defense tips. They were for a very specific audience; well trained martial artists and they came from a very unique individual with a really unique set of experiences. And that is what made it so awesome. So I will share these tips and if you have any questions just let me know. We are usually way to distracted. Our phone being the #1 distraction. Talk about making yourself look like an easy target. Put the phone away. Keep your head up and pay attention. Focus on where you are and where you are going. If you are aware of your surroundings and being very observant you dramatcially cut down on the chance that you will ever be attacked. Attackers are looking for an easy target and a distracted person is a much easier target then someone who has their head up and is being very observant. Ok so this is not politically correct and might not even be legal in some situations but again This is what he said and I just wanted to share. If you feel an attack is imminent then you should act first and or strike first. You do not want to being playing catch up during an attack. Instead think about taking the initiative and surprising your attacker. Now we can step back and apply this in some non violent ways like screaming, running, etc but it is also works well for carjacking type situations or abduction type scenarios. Again just something to think about and keep in the back of your mind. 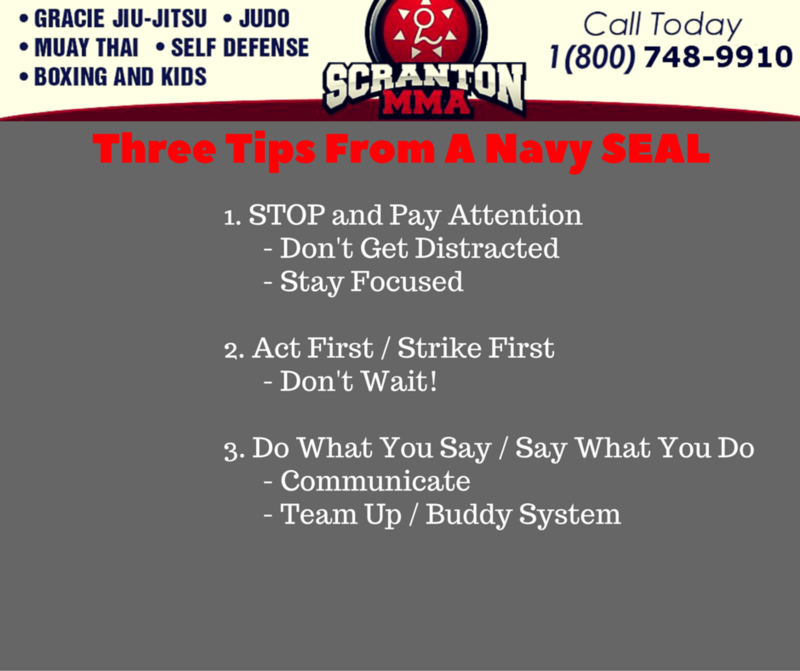 During the seminar we were told that he felt his team and all Navy SEALs are so effective because of their ability to communicate. The phrase they reinforce over and over is Do What You Say and Say What You Do! Now for our everyday life we can apply this in a few ways like always tell people where you are going, When you will be there, etc. Also this can help us make use of the buddy system. If you are out at a restaurant at night and need to go to the ATM dont go alone. Tell a friend and have the friend go with you. If you parked away from others, down a side street, in a dark parking lot do the same. Tell a friend and use the buddy system. It will definitely help keep you a lot safer.